35 (36 3/4, 39 1/4, 40 3/4, 43 1/4, 45, 46 3/4, 49 1/4, 51, 53 3/4, 55 1/4)" bust circumference. 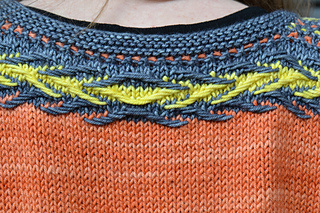 A fun, cheerful, contemporary, and flattering A-shaped tunic is worked seamlessly in the round in Stockinette Stitch with ornamental motifs. 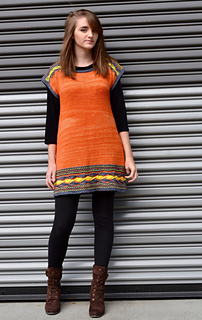 Tunic begins at the bottom with wide and colorful border in slip-stitch patterns using 3 colors. Traditional decreases at “side seams” shape body to armholes. At this time stitches for sleeves are cast on and back and front are separated. Another ornamental motif is finishing the top of tunic. All edges are done in unassuming garter stitch in contrasting collor. Pattern is written for 11 sizes. 35 (36 3/4, 39 1/4, 40 3/4, 43 1/4, 45, 46 3/4, 49 1/4, 51, 53 3/4, 55 1/4)“ / 89 (93.5, 99.5, 103.5, 110, 114.5, 118.5, 125, 129.5, 134, 140.5) cm bust circumference. Choose colors that pop against each other. Wear it over leggings, jeans, or as a dress. Can be easily adjusted in length for a different look.